Two astronauts repair the Solar Maximum Mission Satellite during an EVA on STS-41C in 1984. 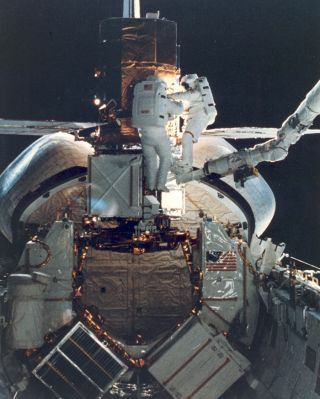 In this historical photo from the U.S. space agency, STS-41C astronauts George D. Nelson, right, and James D. van Hoften share a repair task at the captured Solar Maximum Mission Satellite (SMMS) in the aft end of the Challengers cargo bay. The two mission specialist use the mobile foot restraint and the remote manipulator system (RMS) as a "cherry picker" device for moving about. Later, the RMS lifted the SMMS into space once more.